How Many Lego Bricks Would You Need To Build Your Plastic Dream House? 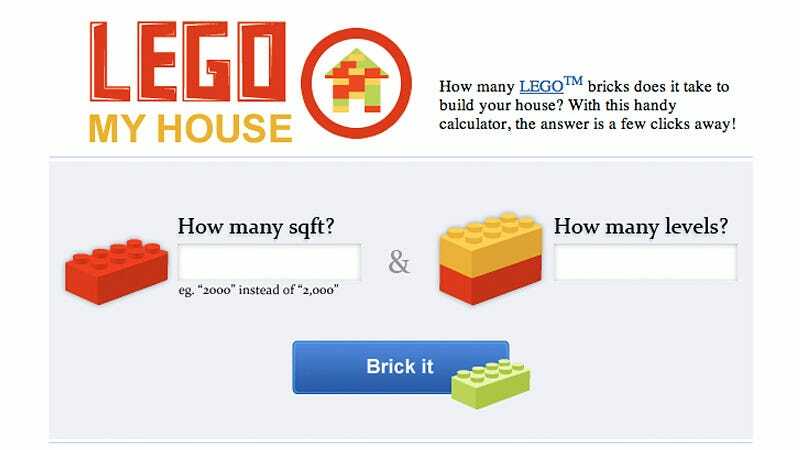 Inspired by the sheer awesomeness that was Top Gear host James May's Lego house, the folks at Movoto Real Estate created an online calculator that tells you just how much Lego you'll need to build your own plastic estate, based on the square footage and number of floors. But how do they calculate the number of bricks you'll need? For starters, they're assuming you'll be happy living in a giant rectangular box lacking doors and windows. (Although, you can probably use those clear pieces to at least let some light in.) And they used the exact dimensions of a standard Lego brick, and the dimensions of a standard sized construction brick in the US to figure everything out. We came up with this figure by first figuring out the size of a standard eight-peg LEGO in inches. We found an excellent resource on LEGO brick dimensions and with some converting from millimeters to inches we had the size of a LEGO: about .26 x .62 x 1.22 inches. After we figured this out we researched the standard size of a brick in the States: 2 1/4 x 4 x 8 inches. The end result: 359 LEGOs per brick. You can try it for yourself below, but don't get too excited. Even a modest sized Lego home is going to cost you over a million dollars in plastic bricks. And you'll probably end up suffocating inside your rainbow cacophony.